The present international design workshop aims to open a discussion focused on the dialogue between art and architecture, set in an historically multi-layered environment with specific urban landscape conditions, promoting the identity of place as a main design conductor. 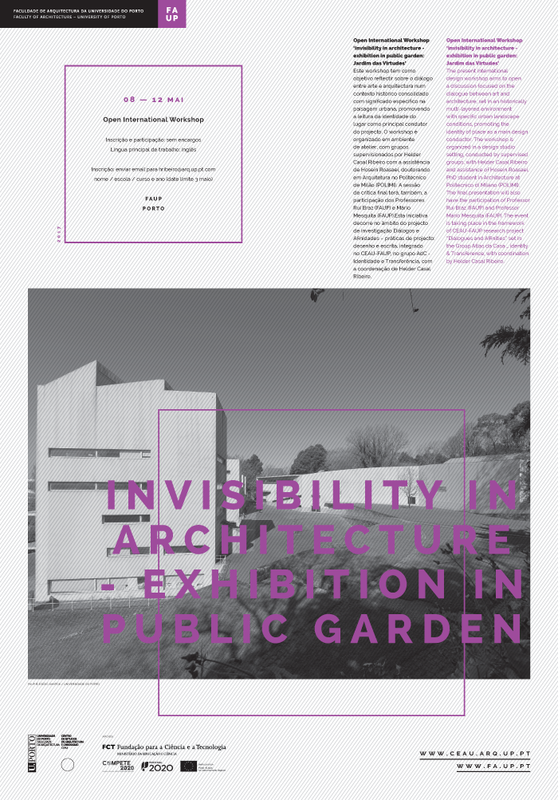 The (re)reading of the natural landscape motivated by the inclusion of a new architectural structure in a public garden with a unique character – Jardim das Virtudes – will address the meaning of invisibility as an architectural notion in the interpretation of Virtudes´ built heritage presence (architectural and landscape) in the center cluster of the city of Porto. The workshop is organized in a design studio setting, conducted by supervised groups, with Helder Casal Ribeiro and assistance of Hosein Roasaei, PhD student in Architecture at Politecnico di Milano (POLIMI). The final presentation will also have the participation of Professor Rui Braz (FAUP) and Professor Mário Mesquita (FAUP). The design schedule, with a total of 50 hours, includes two study–case field trips and a series of key thematic lectures as triggers that aim to enhance the search for an architectural intend within a coherent design approach. The detailed programme will be assembled by each student within a sense of place reading that will express an informed narrative interpreting Jardim das Virtude´s existing identity and inspirations. The programmatic premises consist of five complementary spaces with distinct configurations and atmospheres linked to exhibition amenities, opened to diverse cultural events or simply as a community shelter/individual retreat, interpreting and complementing the existing garden´s character emphasizing the importance of natural light in the modulating of space and form. The new architectural structure(s) can be spread throughout the public garden in open or enclosed system, promoting the quality of an everyday urban promenade. The workshop is organized by CEAU-FAUP research project "Dialogues and Affinities" set in the Group Atlas da Casa _ identity & Transference, with coordination by Helder Casal Ribeiro. Registration: send email to hribeiro@arq.up.pt with name / faculty / course and year.